The Palermo State Fish Rearing Station was established in 1949. In 1957, the facility was expanded by adding a second water supply line and 10 concrete raceways. Raceways were covered in the 1970's. In 2004, a bulk oxygenation system wad added and in 2005 an effluent microscreen filtration unit with a clarifier and solids storage was made operational. 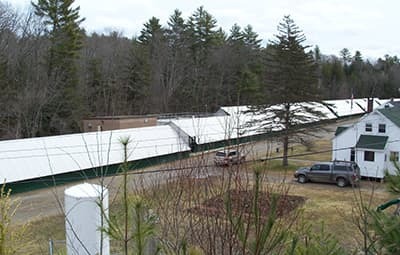 Water for the facility is supplied by Sheepscot Pond through a dual intake system. Two separate supply pipelines seasonally take both cold and warm water from different depths in the lake; water can then be mixed into each individual line of raceways for optimal fish rearing temperatures throughout the year. Supply water is gravity-fed to 31 covered concrete raceways. Species reared at the Palermo facility include brook trout and brown trout. The Palermo facility is referred to as a "rearing station" because it is solely a "catchable" fish production station. There is no "hatchery" on site to incubate or hatch eggs. Advanced fry or fingerlings are transferred in from other hatcheries.